Datura flower (Yangjinhua)-Datura metel L.
Botanical Name: Datura metel L.
Part Used & Method for Pharmaceutical Preparations: The flowers are gathered in the period from April to November, and then they are dried in the sun. 1. Asthma manifested as cough with no sputum and stifling sensation in the chest. 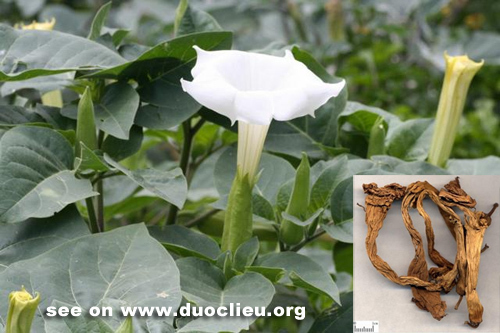 Datura flower (Yangjinhua) is used to roll a ``cigarette" which is lighted and which the patient sniffs. 2. Epigastric and abdominal pain, wind-damp obstruction pain and pain due to external injuries. Datura flower (Yangjinhua) is used alone or with Chuanxiong rhizome (Chuanxiong) and Tetrandra root (Fangji). Cautions & Contraindications: This herb is toxic. It is contraindicated during glaucoma and should be used with caution in cases of weakness of the body and hypertension, and in children and pregnant women.